Coordinating footwear is essential to the completion of any Halloween costume look. Costume boot covers are a great way to simulate a boot-like look without the unnecessary purchase of a pair of boots. These comfortable covers can be used over your existing shoes to create a variety of coordinating footwear for space, superhero, Western or pirate costumes. 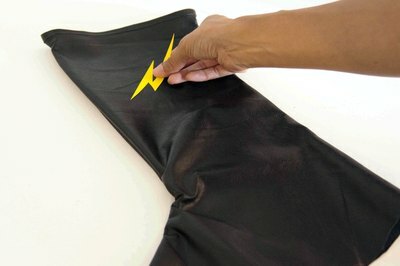 Using basic sewing skills and easily obtained materials, you can create costume boot covers, even at the last minute. Make a leg template from newspaper. Rest the newspaper at ankle level and wrap the newspaper around your calf and ankle. Secure the newspaper in place with plenty of scotch or masking tape. Use a permanent marker to make a mark at the height that you wish the boots to rise to on your leg. Use scissors to cut down the inseam-side of the newspaper wrap to free the newspaper from your body. Lay the newspaper down on a table and draw a horizontal line at the place you have marked. Cut along the horizontal line to trim the newspaper leg template down to size. 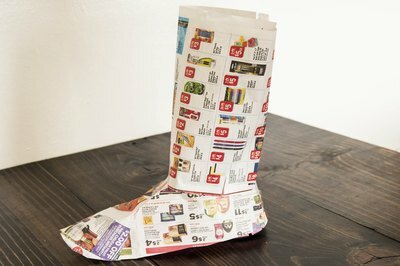 Make a shoe-top template from newspaper. Take one shoe from the pair you intend to wear with your costume and lay it on the table. 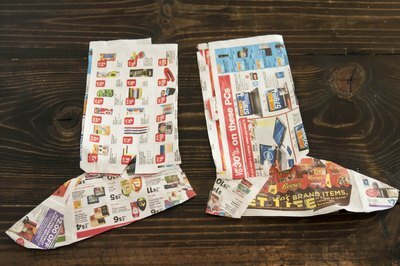 Wrap newspaper around the top and sides of the shoe, using tape to secure the form. Be sure to cover the whole top and side portion of the shoe until it is 1/16 inch from the table. Lift the newspaper template off the shoe after securing the template with tape. Join the shoe-top and leg templates with tape at the ankle. Wrap scotch or masking tape around the ankle joint to create a secure template. Use scissors to cut the newspaper template into one flat piece. Remake a vertical cut down the inseam of the leg piece. Make two small side cuts on either side of the ankle portion to release tension from the template ankle so you can flatten the newspaper template on the table. Cut the synthetic leather (pleather) material using your newspaper template. Lay the synthetic leather face down on a table. Outline the newspaper template, tracing generously on the outer boundary of any cut marks, on the backside of the material, using the permanent marker. Cut the outline out with scissors. Place the synthetic leather cutout on top of the synthetic leather material and outline and cut a second identical shape. 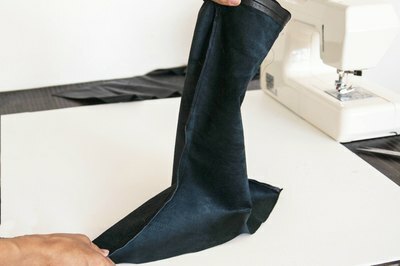 Recreate the ankle inseam using the needle and thread. Pin the inseam together with safety pins and use a straight stitch to sew up the leg at the inseam. Decorate your shoe covers with card stock. Use the colored card stock and scissors to cut out shapes that will accent your boot covers. For instance, cut out yellow lightning bolts shapes for superhero boots, or brown curlicues to accent cowboy boots. Use your hot glue gun to affix these shapes onto your boot covers. Don the completed boot covers, pulling them up the leg into position. Push the shoe-top portion upwards and put on your shoes. Pull the shoe-top portion downwards to rest on the top of your shoes to complete your costume. How Can I Make Felt Cowboy Boots to Fit Over My Shoes?